Minister of State, Joseph Harmon on Thursday presented Region Ten’s top twelve National Grade Six Assessment (NGSA) students with cheques totalling $2.5M, to assist with transportation costs to attend Secondary Schools in Georgetown. Minister of State, Joseph Harmon poses with the top twelve NGSA students of Region Ten after they received their cheques. The bursaries were donated by several of his acquaintances who made pledges at a community meeting held last July in Linden. 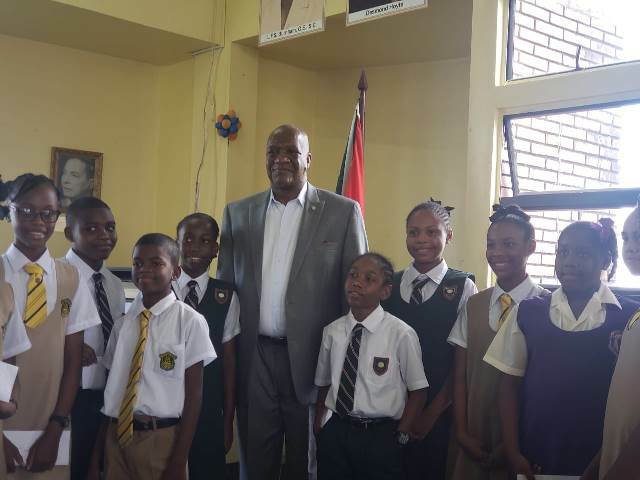 BK International’s Chief Executive Officer (CEO), Brian Tiwarie, through Member of Parliament, Jermaine Figueira also donated $1.5M to the students. At the presentation ceremony, Minister Harmon encouraged the children who were accompanied by their parents, to take all the opportunities afforded to them to extend their knowledge, skills and experiences. Minister Harmon reminded students that they are a vital asset the country and its development. Minister Harmon said the contribution is in keeping with President David Granger’s Five B’s initiative, which ensures more of the nation’s children can attend school thereby having equal access to education. One parent, Rayann Jacobis said that she is appreciative of the monetary support and thanked all those who played a part in making it possible. Story and Image by Vanessa Braithwaite.